What are the Risk Factors of Concrete Mixing Station? How dangerous will happen in concrete mixing station? Concrete mixing station is intelligent and pipelined construction machinery. In the normal mode of operation, concrete mixing plant will not cause casualties, but also appear casualties in some illegal operation. 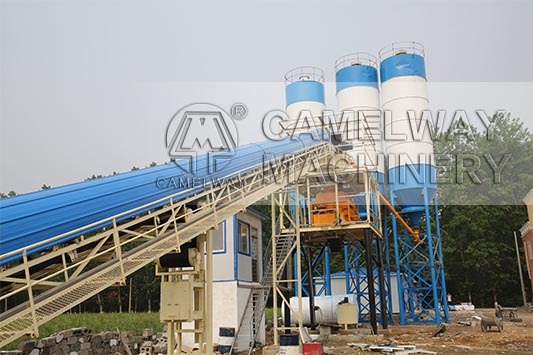 Now Camelway Machinery will explain to us for this aspect of the operation. Staff members are not allowed to stand the beneath of the discharge opening when concrete mixing plant working. concrete mixing plant discharge opening produce material as flood spilling, so it will cause casualties if persons stand the beneath of discharge opening. The mixer in operation, assuming that it appears stirred blocking positions, the staff can not immediately clean up. The power station shall be closed, and then to pick up. So it does not appear problems. In general, concrete mixing station should be operated in accordance with the rules and regulations. If you want to know more about the kind of concrete mixing station construction equipment, please pay attention to our official website. Now the acquisition of our company can participate in concrete mixing plant low down payment, installment promotions.